Pushed filibuster reform through the Senate. In 2013, Sen. Reid facilitated a change in Senate procedure that prohibited filibusters in the nomination progress, allowing a wave of new judges to be named to important appeals courts. Facilitated the Passage of the Affordable Care Act. As majority leader in 2009, Sen. Reid was an integral part of the vote counting and whipping process that allowed the President’s landmark law to be passed without one Republican vote. Engineered Comprehensive Immigration Reform in the Senate. 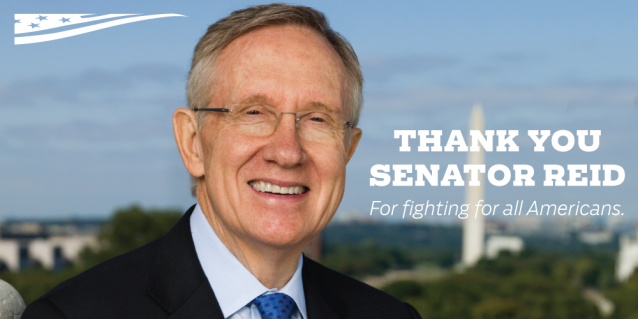 Sen. Reid personally fought for and passed comprehensive, bipartisan immigration bill that passed the Senate in 2013. Unfortunately the Republican-led House never took up the bill, despite overwhelming popular support, so the President was forced to take action without Congress. Advocated for protections for LGBT Americans. Sen. Reid has publicly supported marriage equality, the Employment Non-Discrimination Act (ENDA), and supported the President taking executive action to ban workplace discrimination against LGBT federal contractors. Protected the environment of his home state. Sen. Reid memorably blocked an attempt to use Nevada’s Yucca Mountain as a nuclear waste site, despite approval from the Nuclear Regulatory Commission and pressure from Republicans. He also championed Nevada’s transition away from coal reliance in advocating the state’s energy bill “NVision” that called on the state’s largest utility to eliminate a percentage of coal generation from its portfolio. Additionally, he worked across the aisle to establish Nevada’s Great Basin National Park, protecting more than 77,000 acres of public land. BOTTOM LINE: Overcoming a challenging upbringing with hard work to become one of the most formidable forces for change in American politics, Harry Reid’s life story is the embodiment of the American Dream. It’s part of the reason why he has worked so hard to open the door of opportunity for more Americans. His presence on Capitol Hill will be missed, but his legacy will remain. And if his last 30 years in Congress are any indication, we are looking forward to the next 22 months. If the Postal Service were run like Congress, postal workers would only show up on Tuesdays, Wednesdays, and Thursdays — except when they were on vacation, which would be a lot. 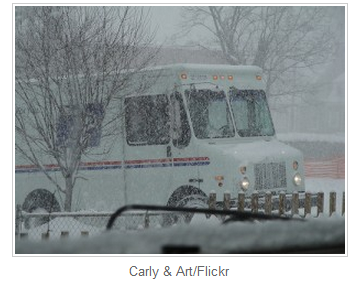 The Postal Service says it’s going to stop delivering mail on Saturdays. This won’t happen until August, but the overseers of our postal workers in Congress are already swooning. “Outrageous” is the cry rolling through the halls of the Capitol. Can’t help it, responds Postmaster General Patrick R. Donahoe. Our postal service is hemorrhaging money, he says, and we have to cut back. Cutting Saturday delivery would save $2.7 billion a year. I don’t know about you, but my mail consists mainly of bills, circulars, and requests for money. I can get by with five days of that instead of six. Whoa! Am I hearing right? Listen, if the Postal Service were run like Congress, postal workers would only show up on Tuesdays, Wednesdays, and Thursdays — except when they were on vacation, which would be a lot. Postal workers would repeatedly go overseas on fact-finding missions and come back empty-handed. Empty-headed too, for that matter. The postal system today is under siege from the Internet. The volume of mail handled by the postal service dropped 22 percent between 2007 and 2011. People complain about the Postal Service all the time. But that’s largely because people these days complain about almost everything all the time. My own experience with the Post Office has been excellent. The clerks at the office I frequent are polite and helpful. The mail I send gets where it’s going in a reasonable time. And my postman knows my name. The Postal Service is a strange, hybrid creature. It’s not quite private, but not completely public either. It doesn’t get any money from Congress, but Congress gets to decide how it runs its business. It’s saddled by our lawmakers, for example, with the obligation of setting aside $5.5 billion every year for future retirees, an obligation that no other entity, public or private, endures. Meanwhile, we have the cheapest first class rates in the English-speaking world. A first class stamp in Canada costs 63 cents. In the United Kingdom, it’s the equivalent of 94 cents. Here, it’s 46 cents. And we complain about that, naturally. The Postal Service is running about a $16 billion-a-year deficit these days. It has some ideas to close the gap, beyond getting rid of the pre-funding of retirement benefits and dropping Saturday delivery. It would like to reduce door-to door service in favor of centralized neighborhood mailboxes, and run its own health care system. But it can’t do all of that without Congress’s cooperation, which seems to have gone on permanent vacation. Sometimes I think we’d be better off if we let Congress run the mail system and let postal workers run the country. At least they’d show up for work.